Q: Do you have any tips for printing checks? • Always have a backup MICR toner cartridge available so you won't have any downtime if you unexpectedly run out of toner or have a problem with the cartridge. • Store toner cartridges in a cool, dark place in their foil bag and box to protect them from light and moisture. Make sure they are stored horizontally, not on end. • Keep your laser printer clean. Paper dust and toner particles can accumulate inside the machine and adversely affect print quality. Every time you change your toner cartridge, use a clean, slightly damp cloth (or a special toner pick-up cloth) to wipe up any residual grime. Consider investing in a minivac (one with a 10-micron filter) to get your printer really clean. • Many laser printers offer an economy print mode. If the printer is set for this mode, the print density may be too light and the magnetic signal strength will not meet the minimum standards. Use the printer panel or printer set-up software to change to normal print mode. • To extend the toner cartridge's life, periodically remove it and rock it gently from side to side a few times while holding it horizontally. This distributes the toner resin more evenly and may help your pages print more uniformly. • Always examine the first few checks in a new check run, especially after adding or modifying bank account data or changing laser printers. Verify the E-13B font and numbers are correct and printing in the proper location. • Look at the MICR clear band (the bottom 5/8 inch) of the check. Make certain it doesn't contain anything printed in MICR toner other than the E-13B MICR characters. Sometimes a portion of a laser printed signature or a graphics line or text from a lower stub will be inadvertently printed within the clear band. This can make the MICR line unreadable by reader/sorter machines. To correct this it may be necessary to modify the print location of the offending characters or graphics. Q: Do I really need to use MICR toner to print checks? A: Yes, if you want to minimize the possibility of additional bank charges. Although there is no law requiring magnetic ink, banks have the legal right to refuse to process checks, drafts, or deposit slips that are not printed with magnetic ink (toner). Banks use high-speed reader/sorter machines to process checks. These machines recognize the E-13B characters printed on the bottom (MICR) line of checks by their magnetic pattern, optical pattern, or a combination of both. Checks that cannot be read by these machines are rejected and must be manually re-encoded, usually with a narrow "repair tape" attached to the bottom of the check. Most banks charge a fee for this service when a large number of checks from an account holder are rejected. Another disadvantage of not using MICR toner is that your bank statements may be missing check numbers, making them harder to reconcile. Q: Can I use MICR toner to print everything? A: Yes, MICR toner is excellent for printing text and graphics as well as checks. By keeping the magnetic toner cartridge in the printer and not swapping it with a non-magnetic cartridge you decrease the possibility of accidentally printing checks with the wrong toner. It also reduces wear and tear on the printer. Q: How can I find out which of your MICR toner cartridges is compatible with my laser printer? A: Refer to our microMICR Toner Cartridge Selection Guide and find the Hewlett Packard or Lexmark model which you think is compatible. Click on the "Part #", which will bring you to a description of the cartridge and a comprehensive list of compatible printers from different manufacturers, if any. While we have attempted to be as thorough as possible, it is possible that some compatible models are not listed. Please contact our technical support if you need further assistance. Q: Are magnetic ink jet cartridges available for my ink jet printer? A: No, we are not aware of any magnetic ink jet cartridges currently on the market. Because of the wide variation of ink absorption with different papers, it is unlikely that an acceptable formula will be found that is capable of producing a consistent quality magnetic signal. Q: I just put a new toner cartridge in my printer but the pages are coming out blank, why? A: There is a shipping seal in most new cartridges which must be removed in order for the cartridge to function properly. Follow your printer's instructions for installing a new cartridge. Q: How long can I continue to print checks after the ‘TONER LOW’ message comes on the printer? A: When your printer displays the ‘TONER LOW’ message, we advise that you do not use the cartridge to print any more checks because the printed MICR characters may not contain enough magnetic ink to be properly recognized by the bank's reader/sorter equipment. Since there is probably still some toner left in the cartridge, you may continue to use it to print other, less critical, types of documents. Q: Why are there vertical white streaks or faded areas on the page? A: This usually indicates that the cartridge is almost out of toner or your density setting is too light. Check the printer User's Manual for instructions on how to adjust the print density. You can also remove the cartridge and gently rock it from side to side several times to evenly distribute the toner and replace it in the printer. Q: My document printing very light. Why? A: If the seal was pulled properly and your pages are still printing light, check the density setting and adjust it accordingly. Make sure that your printer is not set to print in "econo-mode". It is also possible that your toner cartridge is almost empty. Q: I am getting a gray shading on my document. The page looks "dirty". What is this from? A: It is possible that the density setting on the printer is too dark or that excess toner has built up inside the printer and it is ready for cleaning. Excessively high or low humidity levels in the office environment can also cause this gray backgrounding, particularly during Winter months with the LaserJet 3Si or 4Si printer. MICR toner is more electro-conductively sensitive than standard toner and the excessively low humidity that occurs from heaters drying the office air during the Winter season increases the amount of static electricity, which causes more toner to adhere to the drum creating the gray backgrounding on the paper. Most laser printers' environmental specifications for relative humidity are between 20% and 80% for printing operations. Some offices have solved the problem by placing a humidifier in the area of the printer. Newer model printers also seem less susceptible to the humidity problem. Q: I am getting a gray/black smear at the top edge of the page. What causes this? A: The paper feed guide in the printer is probably dirty. Refer to your printer User's Manual and perform regular scheduled cleanings, as described. Q: In my HP LaserJet Series II or III, I am getting smeared gray vertical lines down the page. What causes this? A: The fuser cleaning wand may be dirty or worn. You need to change the cleaning wand each time you change the cartridge. A new wand is supplied with each LaserJet II and III cartridge. Q: In my HP LaserJet Series II or III, I am getting vertical black streaks on the page. What causes this? A: The primary corona wire (located inside the toner cartridge) may be dirty. Refer to your printer User's Manual for instructions on proper cleaning. Q: I am getting horizontal streaks across the page. What causes this? A: The toner cartridge may not be installed properly in the printer. Remove it and carefully follow your printer's instructions for installing a toner cartridge. Q: I am getting a spot repeating continuously down the page. What can I do? A: You might have one of the following: a blotch of toner on the drum, or a piece of lint or foreign object on the drum. Remove the cartridge, pull back the drum cover and rotate the drum by turning the gears until you see the spot. Gently wipe the drum with a clean paper towel. Reinstall the cartridge and see if the spot goes away. Q: Do I need to use a Font Cartridge, SIMM, DIMM, or other font device to print checks? A: You may or may not need a font device to print checks, depending on the software you are using for check printing. If your software tells you to use pre-printed check stock (which is already encoded with the magnetic numbers) you do not need the special font. There are also some applications programs that include the font in the software which is downloaded to the printer as needed. However, for security reasons, many programs require a font cartridge, SIMM or DIMM to be present in the printer in order to print checks. In some cases, the cartridge/SIMM/DIMM contains a signature or logo to be printed on the document. Q: How do I know what type of font device to get for my HP printer? A: Most Hewlett Packard printers through the LaserJet 4+ use one or more font cartridges (these have a rectangular slot about 3.5 x 1 inches) while newer models like the LaserJet 5 and 6 family support SIMM fonts (and don't have a slot). Some models support both cartridge and SIMMs. Some models, like the LaserJet 4L, 5L and 6L, do not support either cartridge or SIMM. LaserJet 2100, 4000, 4050, 5000, 8000 and 8100 models use a DIMM instead of a SIMM or cartridge. The Secure Font System font device can be used with all models of LaserJet printers that have a parallel port. If you have an HP printer and are unsure what type of font product it uses, refer to our Compatibility Table. Q: How do I install a Font Cartridge in my printer? We recommend you power off the printer before inserting the cartridge (see #3 below), then power on. 2. Make sure the FORM FEED indicator is off. If it is on, after the printer has stopped receiving data, press the [FORM FEED] key to print the remaining data. 3. Insert the cartridge into the printer’s font cartridge slot and push until the cartridge is firmly seated. You should hear and feel the cartridge snap into place. In printers that have more than one slot the cartridge may be installed in any slot. NOTE: microMICR makes different format font cartridges, and the label may be on top or the bottom. On some printers, the cartridge may be appear to install correctly, but actually be inverted. If the cartridge seems not to work, follow the procedure below for removing it, then turn it over and reinstall. 4. Return the printer ON-LINE by pressing the [ON-LINE] key. (The indicator light should be on.) Test the cartridge. Q: How do I install a Font SIMM in my printer? A: The microMICR SIMM (Single Inline Memory Module) Font Device installs in any of the following Hewlett Packard LaserJet printer models and their variants: LaserJet 3Si, 4Si, 4, 4plus, 4V, 4P, 5, 5P, 5Si, and 6P. Note that the SIMM is not compatible with LaserJet models 4L, 5L and 6L, nor with the newer models that use DIMM memory. CAUTION: Static electricity can damage SIMMs. When handling SIMMs, either wear an anti-static wrist strap or frequently touch the surface of the SIMM's anti-static package, then touch bare metal on the printer. 1. Turn the printer off. Unplug the power cord and disconnect any cables. 2. Open the SIMM access door. The board may be installed in any available SIMM slot. We recommend that any permanent memory SIMMs be installed in the rightmost or lowest slots and the Font SIMM be installed in the next vacant slot. 3. When you remove the SIMM from the anti-static package, hold it by the side and back edges only, with the metal teeth facing the slot, positioning notch down (or right). The notch prevents the SIMM from being installed backwards. 4. In printer models where the SIMM slots are vertical, as in the LaserJet 4 and 4plus, position the SIMM with the metal teeth facing the slot so that the notch on one end of the board is on the bottom. The components will be on the right side of the board. 5. In printer models where the SIMM slots are horizontal, such as the LaserJet 4P, position the SIMM with the teeth facing the slot and the notch on the left side. The components will be on the bottom of the board. Note: in some printer models (like the 4P), the SIMM will only fit in the middle or top slot due to its size. It may be necessary to relocate an existing SIMM. 6. Hold the board at a 30 degree angle and firmly push it with your thumbs into the slot. Push the board into the back of the slot to evenly seat it. 7. Rotate the board straight toward a 90 degree angle until the clips on the edges of the slot snap into place (you will feel and hear a "click"). 8. Close the SIMM access door. 9. Re-attach any interface cables and the power cord, then turn the printer on and test the SIMM. NOTE: Always power off the printer whenever installing or removing the Font SIMM. Q: How do I install a Font DIMM in my printer? A: Follow the instructions provided in your printer’s documentation for installing DIMM memory options. They will describe where to locate and how to access the DIMM slots for your model. The following steps apply to the LaserJet 4000. Directions for other models may differ. CAUTION: Static electricity can damage DIMMs. When handling DIMMs, either wear an anti-static wrist strap or frequently touch the surface of the DIMM's anti-static package, then touch bare metal on the printer. 2. Grasp the cover and pull it firmly toward the rear of the printer until it stops. 3. Remove the cover from the printer. 4. Loosen the captive screw holding the DIMM access door with a Phillips #2 screwdriver. Open the door. 5. Remove the DIMM from the anti-static package. Hold the DIMM with fingers against the side edges and thumbs against the back edge. Align the notches on the DIMM with the DIMM slot (check that the locks on each side of the DIMM slot are open, or outward). 6. Press the DIMM straight into the slot (press firmly). Make sure the locks on each side of the DIMM snap inward into place (to remove a DIMM, the locks must be released). 7. Close the DIMM access door and tighten the screw. 8. Set the bottom of the cover onto the printer. Make sure the bottom tabs on the cover fit into the corresponding slots in the printer. Rotate the cover up towards the printer. 9. Slide the cover toward the front of the printer until it clicks into place. Re-attach any interface cables and the power cord, then turn the printer on and test the DIMM. Always power off the printer whenever installing or removing the Font DIMM. Q: How do I install the ValuePort Font Device? 2. Connect the ValuePort into the printer’s Centronics parallel port. If your computer or network is connected to that port, remove the cable and plug it into the connector on the back of the ValuePort (with the clips). If your printer has the new style mini-parallel port, you will need an adapter for the ValuePort. 3. When you power on the printer the ValuePort will automatically download its resources. Note: If the printer is reset, the ValuePort resources are deleted. You may re-load these by pressing the black button on the Versa-Port while the printer is on. Always power off the printer whenever installing or removing the ValuePort. Q: How do I install the ValuePort in a LJ 2100 or 2200 Printer? A: Some LaserJet printer models (like the 2100 and 2200) have recessed or hidden access to the parallel port which hinders attachment of the cable to the ValuePort. To solve this problem you need to use a parallel cable extender. Part # FXC-120 is a 12 inch cable extender which can be ordered from microMICR Corporation. Q: How do I install the Secure Font System Font Device? 2. Plug the 9 volt DC power adapter into a standard 120 volt AC outlet and plug the other end into the auxiliary power jack on the base unit. The LED should start flashing amber. 3. Find the parallel port on your printer. If it is the standard (large) Centronics parallel port, use the supplied IEEE-1284 compliant standard cable to connect the base unit to the printer. If your printer has the new style mini-parallel port, use the supplied IEEE-1284 compliant mini-parallel cable to connect the base unit to the printer. 4. If your computer is connected to the printer's parallel port, remove that cable from the printer and plug it into the connector on the base unit (with the clips). If your printer has the new style mini-parallel port, you can use the supplied standard cable to connect the computer to the base unit. 5. Power on the printer. After a few seconds the LED on the base unit will change to steady green. Note: If the printer is reset, the Secure Font System resources are deleted. You may re-load these by pressing the black button on the Base Unit two times while the printer is on. Always power off the printer whenever installing or removing the SFS Base Unit. Q: How do I install the Secure Card? A: To Install the Secure Card, simply insert it into the slot in the Base Unit. The Secure Font System Base Unit should already be installed as described above and the printer should be on. The Secure Card only fits one way into the slot, and when fully inserted, should extend outside by about 5/8 inch (1.2 cm). It may take several seconds for the fonts, signatures, logos to load into the printer. Q: How do I know if the Font Device is working? A: After installing the Font Device you should test that it is properly installed by printing a Font List. Some LaserJet printers call this a PCL Font List or a PCL Typeface List. The procedure for doing this varies with the printer model, and is usually done using the buttons on the printer panel. Refer to your printer’s documentation for specific instructions. The Font List will display samples of all the typefaces available to the printer in a format that varies with the printer model. Only a few representative characters from each typeface are printed. It is a multi-page printout listing each of the fonts within categories. The order of the categories is normally the same in all printers but the descriptive headings for them may be worded differently and will be limited to the types of font devices compatible with the specific model. The order is PCL Permanent Soft Fonts, Cartridge Fonts, ROM SIMM M#, ROM DIMM Slot #, and lastly, Internal Fonts, which are the fonts "built-in" to the printer. If the Device Fonts are not printed, turn off the printer and follow the instruction to remove and reinstall the Font Device. Then turn on the printer and try the test again. Plug in the printer and switch it on. The READY message should appear on the display. Follow the instructions in the printer User’s Manual to print a FONT TEST or PCL TYPEFACE LIST, depending on the particular model. The printout will list samples of all cartridge and SIMM fonts under the appropriate heading. For example, the LaserJet III Font list will identify either LEFT or RIGHT FONT CARTRIDGE. The LaserJet 4 will list all CARTRIDGE FONTS and ROM SIMMs by slot number. These lists will also print all the printer's internal fonts and may run several pages. You can also try running your application software to print checks. Q: Will my Font Device ever wear out? A: Each microMICR Font Device is tested for quality control purposes before shipping and the test sheet is enclosed in the box. The test sheet also contains information about each font such as the PCL escape sequence used to select it. It is unlikely that the font device would ever wear out during normal use. However, since it is an electronic component, it is sensitive to electrical and physical damage. SIMMs and DIMMs are exposed electronic circuit boards which are sensitive to electrostatic discharge and must be handled carefully to avoid damaging the components. Always wear a grounded anti-static wrist strap or frequently touch bare grounded metal before handling the device. After installation, SIMMs and DIMMs are intended to remain in the printer, but if it becomes necessary to remove the device, handle it carefully and replace it in the anti-static Mylar bag. When installing or removing microMICR Font Devices, other than font cartridges, the printer must be powered off. Should the microMICR Font Device ever fail due normal use, contact microMICR customer service for instructions on how to obtain a replacement. Q: How do I access the fonts on the microMICR Font Device using PCL? Most software programs allow you to change fonts by using printer command escape sequences. They are so called because each command begins with an escape character which is followed by a sequence of other characters. These consist of a prefix, that tells the printer the type of command, followed by optional parameter values and a final uppercase letter that completes the command. The complete set of printer commands makes up the Printer Control Language (PCL) used by LaserJet printers to control page formatting, print positioning, graphics and other miscellaneous functions in addition to font selection. Refer to the Printer Command Table in your LaserJet User’s Manual for a complete list of commands. Escape sequences can be included as part of the software’s initialization (sometimes referred to as set-up string), embedded in a text file or directly passed to the printer in a stand-alone program. Software packages have different ways of inserting or representing the escape character, generally using its ASCII numeric value of 27 in decimal or 1B in hexadecimal. Your software application manual should provide an explanation of how to use escape sequences with the program. Q: I printed checks but the numbers on the MICR line don't look right. What should I do? A: First make certain the font device is present in the printer (if required by your software). Perform a printer RESET (according to your printer's instructions) or turn it off and back on. Try printing a test check again. If the numbers still do not look correct, turn off the printer and unplug it. Remove the font device, reinstall it, and try printing again. The most common problem, not selecting the correct font, is almost always due to an incorrect PCL escape sequence. Escape sequences are case sensitive; that is it makes a difference whether upper-case (capital) or lower-case (small) letters are used. In general, each printer command that begins with an escape character, ends with an upper-case letter. Any letters used within a command other than the final upper-case letter must be lower-case. An upper-case letter "O" is sometimes confused with a zero "0"; a lower-case "L" for the number "1". If the MICR line numbers still look like the wrong font, call microMICR technical support for further assistance. Q: I have a microMICR Custom Font Device. How can I print the custom signature or logo? A: If you have a microMICR Custom Font Device, it contains one or more custom signatures or logos in the form of a font. It is a somewhat unusual font because it may only contain one or two characters instead of the full alphabet with number and symbol characters found on typical fonts. Treating a signature or logo image as a font character results in quicker output since the printer can print a character in its memory much faster than it can print a graphic. To select the custom font, use the full escape sequence printed on the test page to "call" the custom font. Then print the letter which corresponds with the image you want to print. The first image usually corresponds to the upper-case "A"; that is, when the custom font is selected using the above described escape commands, the printer will print the image each time it is told to print the letter "A". If more than one image is on the font, the second will be mapped to "B", and so on. Because there are no other characters in the custom font, attempting to print characters other than those listed on the test sheet will usually result in nothing being printed. In determining the print location of the image, the printer will place it at the current print position starting at the lower left corner of an imaginary rectangle which encloses the entire image. 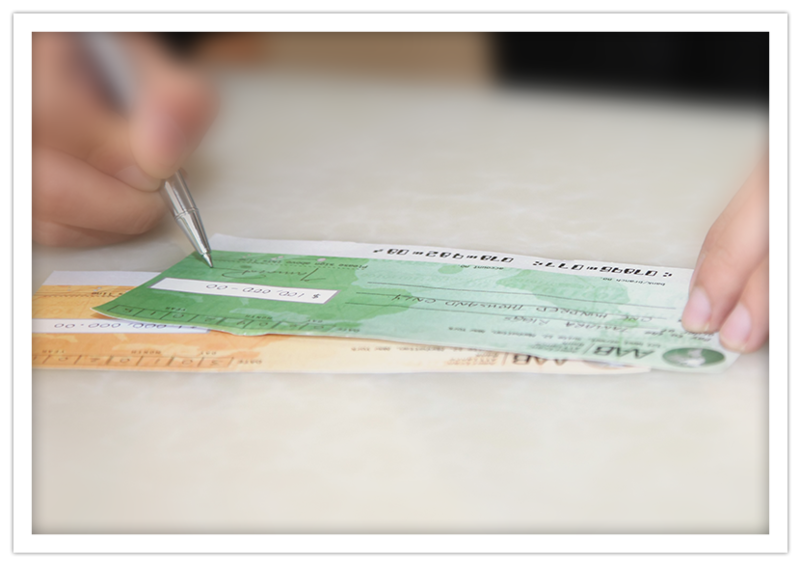 When printing signatures on checks, be sure that lower-case descenders (like the hook of a "y") do not print within the bottom 5/8 inch clear band of a check, which must not contain any print other than the MICR characters. Q: I tried following one of the above procedures for my problem, but it didn't help. Should I send it back? Do not send any product back to microMICR without first obtaining an RMA (Return Merchandise Authorization) Number. Q: What is microMICR's warranty on its MICR Toner Cartridges? A: MICR Toner cartridges from microMICR Corporation are manufactured in our own facility using strict quality control standards, assuring the highest performance and reliability available. Each microMICR Toner Cartridge is warranted to meet ANSI/ABA print quality and signal strength standards when used with the proper E-13B font and MICR bond check stock; and to be free from defects in materials and workmanship for a period of one year from date of purchase, or until the toner is depleted, if sooner. Defects in MICR Toner Cartridge print quality, material, or workmanship should be reported to microMICR. Upon inspection of the cartridge with print samples, if we find it to be defective, we will replace the cartridge. If the product is damaged, such damage must be determined not to have been caused by misuse or abuse by the user. Toner cartridges that are empty or nearly empty are deemed to have been used and, therefore, are not considered defective. Note: In no event shall microMICR Corporation be liable for any incidental, consequential, special, indirect, punitive, or exemplary damages or lost profits from any breach of this warranty, or otherwise. Q: What is microMICR's warranty on its Font Products? A: MICR Font Products from microMICR Corporation are manufactured or assembled in our own facility using strict quality control standards, assuring the highest performance and reliability available. Each microMICR Font Product is warranted to be free from defects in materials and workmanship for a period of six months from the original date of purchase. Any microMICR Font Product suspected of being defective should be reported to microMICR. After it is returned for inspection, if we find the Font Product to be defective, we will replace it. If the product is damaged, such damage must be determined not to have been caused by misuse or abuse by the user.